Distinctive head with beautiful silky covering, with large, wise, intelligent eyes offsetting long low weaselly body. Short, strong legs, weatherproof coat. Head strongly made, large but in proportion to dogs size, muscles showing extraordinary development, especially the maxillary. Skull broad, narrowing towards the eye, measuring about the same from inner corner of eye to back of skull as from ear to ear. Forehead well domed, head covered with very soft, silky hair not confined to mere ‘topknot’. Cheeks gradually tapering towards deep and strongly made muzzle. Muzzle in proportion to skull as three is to five. Top of muzzle has triangular bare patch pointing backwards to eyes from nose about an inch broad. Rich dark hazel, set wide apart, large for a small dog, bright, full and round but not protruding. Pendulous, set well back, wide apart, low on skull, hanging low to cheeks with a very slight projection at base, broad at junction of head and tapering almost to a point, forepart of ear coming almost straight down from its junction with head to tip. Cartilage and skin of ear very thin. Length of ear from 7.5-10cms (3-4inches). Ears harmonise in colour with body colour. In a pepper dog, covered with straight, dark hair (in some cases almost black). In a mustard dog, hair mustard in colour, a shade darker than the body but not black. Both should have a thin feather of light hair starting about 5 cms (2 inches) from the tip, and of nearly the same colour and texture of ‘topknot’, giving ear appearance of a distinct point. This may not appear until after the age of 2 years. Jaws strong with a perfect, regular and complete scissor bite, ie upper teeth closely overlapping lower teeth and set square to the jaws. Any deviation highly undesirable. Teeth very strong especially canines which are extraordinary in size for a small dog. Canines fit well against each other, to give greatest available holding and punishing power. Inside of mouth black or dark coloured. Hind legs a little longer than forelegs; set rather wide apart, but not spread out in an unnatural manner; thighs well developed. Stifles angulated, hocks well let down. Dewclaws, if present, customarily removed. Round and well padded. Hind feet smaller than forefeet. Nails dark but varying in shade according to colour of body. Flat or open feet highly undesirable. Rather short from 20-25 cms (8-10 ins), rather thick at root, getting thicker for about 10 cms (4 ins) and tapering off to a point. Not twisted or curled in any way but with a curve like a scimitar, the tip when excited being in a perpendicular line with root of tail, set neither too high nor too low. When not excited carried gaily a little above body level. Very important feature of the breed. Hair should be about 5cms (2ins) long. Double coat with a soft linty undercoat and a harder topcoat, not wiry but giving crisp feel to the hand. The coat should not ‘shed’ down the back, but should lie in pencils caused by the harder hair coming through the softer undercoat. The forelegs have feather about 5 cms (2 ins) long. Upper side of tail covered with wiry hair, underside not so wiry with neat feathering of softer hair. Pepper: Ranges from dark bluish black to light silvery grey, intermediate shades preferred. Body colour coming well down shoulder and hips gradually merging into colour of legs and feet which varies according to body colour from rich tan to pale fawn. Profuse silvery white ‘topknot’. Mustard: Varies from reddish brown to pale fawn. Profuse creamy white ‘topknot’, legs and feet of darker shade than head. In both colours feather on forelegs rather lighter than hair on fore part of leg. Some white hair on chest and white nails permissible. White feet undesirable. Hair on underside of tail lighter than on upper side which should be darker colour than body. The height at withers should be from 20-28cms (8-11ins), length from withers to root of tail should not be more than twice the height, but preferably 1inch to 2ins less. Weight: 8-11 kgs (18-24 lbs) for dogs in good working condition. The lower weights preferred. 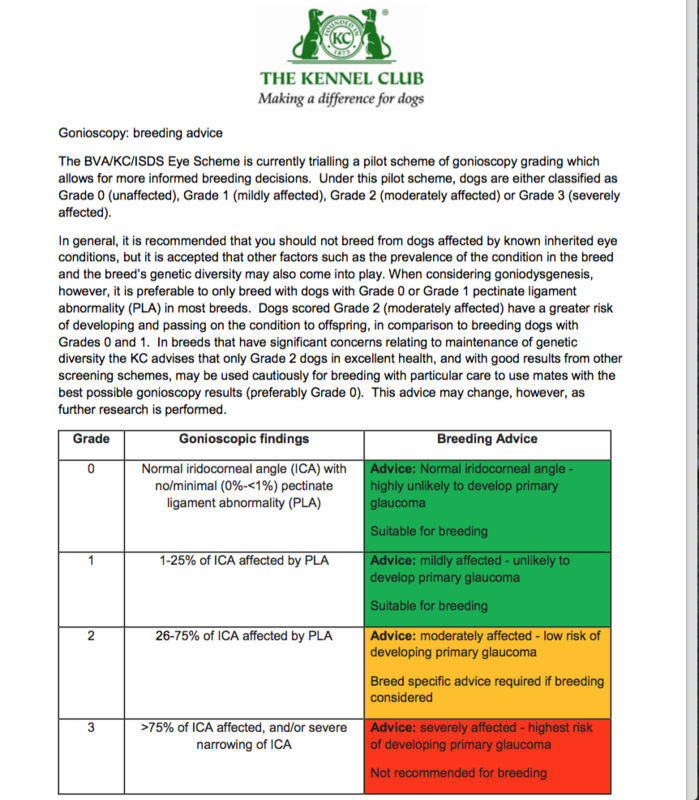 Published with kind permission of the Kennel Club. The Dandie Dinmont Terrier is on the schedule A list for eye testing and it is recommended that they should have their eyes tested at least every 3 years by a member of the BVA Eye Panel. Any advice re increased frequency of test should, of course, be taken from your eye specialist. Click here for a list of Eye Panelists (Jan 2019 ). Tests carried out prior to the pilot study (July 2017) will have ‘G’ unaffected or affected marked on their certificates. Any new results received from 1st January 2018 will have the PLA (Pectinate Ligament Abnormality) grade (0,1,2,3) recorded. The results will be published by the Kennel Club. Often new puppy owners become concerned about the way their puppy’s teeth seem to be coming through. In some cases, they are advised by their vet that corrective surgery is needed. If this is the case with your puppy you are strongly advised to consult your breeder/mentor before agreeing to anything. 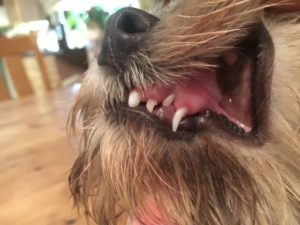 The Dandie can be different in the way it’s adult teeth come through and align. 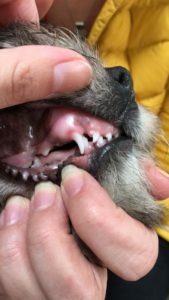 It is s not unusual for Dandie puppies teeth to look like they are going straight up or that their canines are not forward enough, they will move forward and out at the last minute. Both puppies below went on to have a perfect scissor bite with not intervention. We have compiled a list of SOME Dandie Dinmont Terrier breeders. Details of available puppies can also be found by contacting our puppy coordinator, Mr Keith Marshall keith1marshall@outlook.com 07541603756 or at The Kennel Club – find a puppy. If you are a breeder and wish to be added to the list please contact us. The Dandie Dinmont Terrier is classed as a non- shedding breed. He is double coated meaning his body coat or “jacket” consists of a crispy topcoat for waterproofing and a softer linty undercoat for insulation. His legs, underneath, and head consist of softer hair. General maintenance of your dog’s coat should mean he is brushed thoroughly several times a week, the amount depending on his environment. Puppies should be groomed daily. Care should be taken that the coat is groomed right through down to the skin and that any knots or tangles are gently teased out with your fingers or dispersed carefully using a matt splitter. The most common place for knots to be missed is inside the legs at the top. To keep a dandie in the correct coat he should be hand stripped and the puppy coat should be stripped out by around 4 months. With an adult pet dandie, it is usually sufficient to have hand stripping done around 4 – 6 times a year depending on the rate at which the coat grows. If however, you wish for your dandie to have a tidier appearance then the coat may need to be rolled more often. This can be done by your groomer or you may wish to learn to do it yourself. A dandies coat can, if wished, be clipped for convenience but if this is done it will lose its crispness and colour and will not be as waterproof. It may also be impossible to return it to its pre-clipped condition or it may many months and a lot of work to try and get it back to a strippable coat if this is later wished for. Please note that if the dandie is spayed or neutered then the texture of the coat sometimes changes. Stripping the coat may become difficult and may start to become uncomfortable for the dog or in some cases just doesn’t strip out to look right. In these instances then the coat should be clipped. A list of experienced dandie groomers can be found below. If you are an experienced Dandie groomer and would like to be added to our list please contact us. Do you have a dandie dinmont? Perhaps you’re thinking about showing or breeding or just need some advice. We would always advise people to contact their breeder in the first instance but sometimes this is not possible. In this case, the Caledonian Club has compiled a list of Breed Mentors who between them have hundreds of years of experience. If you would like some advice please contact our Secretary Mr Keith Marshall using the contact form. He will give you details of one or more of the breed mentors who will be able to assist you.